glitch in computer software. 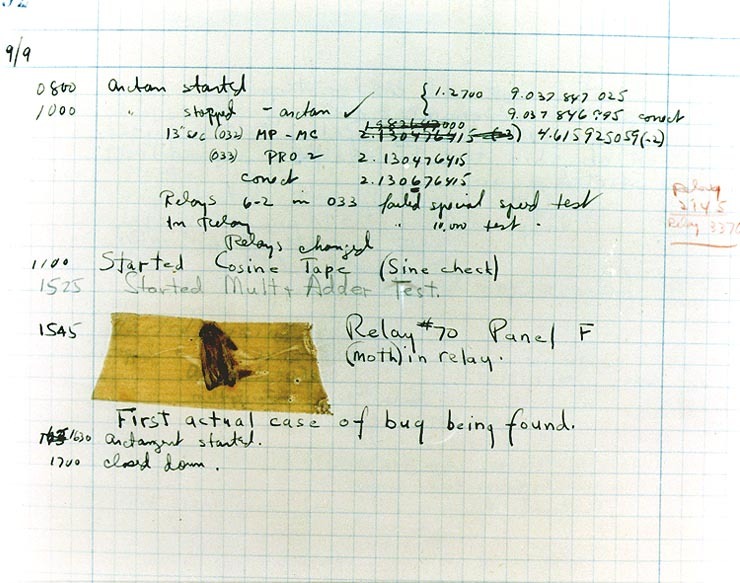 The picture at the right shows the original bug which was foolish enough to wander into one of the early massive computers developed during the 1940s. The bug died, the computer glitch was fixed, but the term lives on. When Grace Hopper was born in 1906 in New York City, probably no one was thinking about computers. The word “computer”, if it was used at all, meant a person who did a lot of arithmetic. Grace Hopper, or Grace Murray as she was then, was a good student and she liked arithmetic. At Vassar she majored in Mathematics and graduated Phi Beta Kappa. She earned an MA and eventually a PhD in mathematics at Yale, even though math was considered a man’s field and she had very little encouragement. Eventually she became a professor at Vassar (significantly, a women’s college) and married a professor from New York University. computers at Harvard and later moved on to private companies which entered the field during the postwar years. But she always maintained her status with the Navy and eventually became a Rear Admiral. During the last decade of her life, before her death at the age of 83, she served as a public relations spokesperson for the Navy and the tech industry. The early computer machines developed were meant to make arithmetic easier, faster, and more accurate. Most of the early computer scientists concentrated on the hardware to make computers work faster and to make them less cumbersome. In the early days a computer was about the size of a room, and the room had to be air conditioned to keep the machine from overheating. Grace Hopper recognized that software was as important as hardware and that programmers were as essential as engineers in computer development. She realized that computers could be widely used in business if they were made more user-friendly and could be programmed in a language more understandable to human beings. She developed the first compiler program and worked on COBOL, which used language closer to English than to machine language. COBOL was hugely popular and was the basis for much of the growth of computer use in business as well as education and government institutions. Despite Grace Hopper’s importance in early computer work, her legacy did not lead to an influx of women into the tech industry. During the Grace Hopper Celebration of 2014, many people commented on the shortage of women in the largest tech companies. Google, Apple, Facebook all of the best-known companies, suffer from a lack of women on their staff. This is odd when we consider that women are heavy users of computers especially for online shopping, gaming, and social media. Now that computers are fully integrated into all facets of our lives including art, music, and social life it’s hard to see why more women don’t enter the field. Perhaps we could be more inspired to go into work with computers if we learned more about leaders like Grace Hopper. There is a good biography of her by Kurt W. Beyer called Grace Hopper and the Invention of the Information Age (2012) that you may be able to find in your local library. A new book by Walter Isaacson, The Innovators, covers many of the early leaders including Hopper. I haven’t seen that one yet, but it’s likely to become a best seller like his biography of Steve Jobs and may be a great introduction to Grace Hopper’s world. I had the pleasure of attending a talk by Admiral Hopper some years back. She was a brilliant, articulate and entertaining speaker. She is one of my personal heroes. I envy you for having actually seen and heard Admiral Hopper. She is a hero of mine too and I wish more people knew about her. This is fascinating! 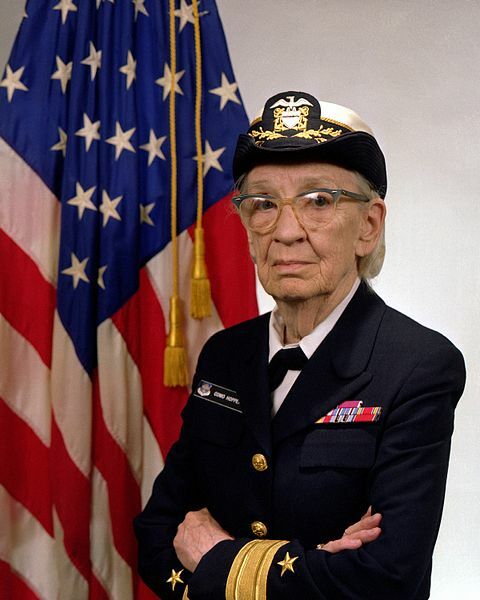 I had never heard of Grace Hopper! And I agree that we need more women in the “computer world” – since there is now just about no aspect of the world that is NOT influenced by computers.